Deep in the heart of Georgia’s Oconee National Forest exists a place difficult to find and even harder to forget. This hunting retreat, known as Fishing Creek Farms, was created in 2002 as a private hunting lodge for construction executive Rob Taylor and his family. In 2016 Rob began allowing small private parties to hunt the quail courses that sit amongst the property’s longleaf pines and hardwood creeks. What guests found was the fast coveys, nimble dogs and quality habitat that since have become hallmarks of the Fishing Creek experience. On my first morning at Fishing Creek I awoke to a sheen of glistening ice crystals carpeting the manicured lawns surrounding my cabin. At the lodge I was met by guide Scott Kuhn and his team of pointers, German shorthairs and English cockers. I learned that Scott and his wife, Tyla, had bred and trained all of the pointing dogs at Fishing Creek and that they also had trained their kennel full of English cockers, many of whom were first-generation imports from top UK field-trial lines. Rob Taylor joined Scott and me for the morning hunt, and I was thankful for the Ranger we were traveling in as we followed the wide-ranging dogs. The cover we hunted consisted of areas of pines and broomsedge interspersed with mixed hardwoods and even open ground, complete with briers and other early successional vegetation. One constant was the undulating hills that make Fishing Creek unique. As the morning progressed, a pattern emerged of quality dogwork: the pointers and shorthairs finding and holding coveys and the cockers launching the birds for the Guns. With our hunt drawing to a close, the dogs located one final covey. This time a pair of pointers had split and stood motionless almost 40 yards apart—both pointing in different directions. We approached through the middle, with my cocker Austin on the ground. I sent Austin to flush, and three quail rose to my right, catching me off guard. Fortunately there were two laggards, and I managed to muddle down a double. As Austin went to collect my birds, the other half of the covey, which was being held by the second dog, rose in front of Rob. A pretty bit of shooting resulted in Rob collecting his own double. Fishing Creek offers six luxury guest rooms, each with a private bath, and can accommodate six hunters and their partners. 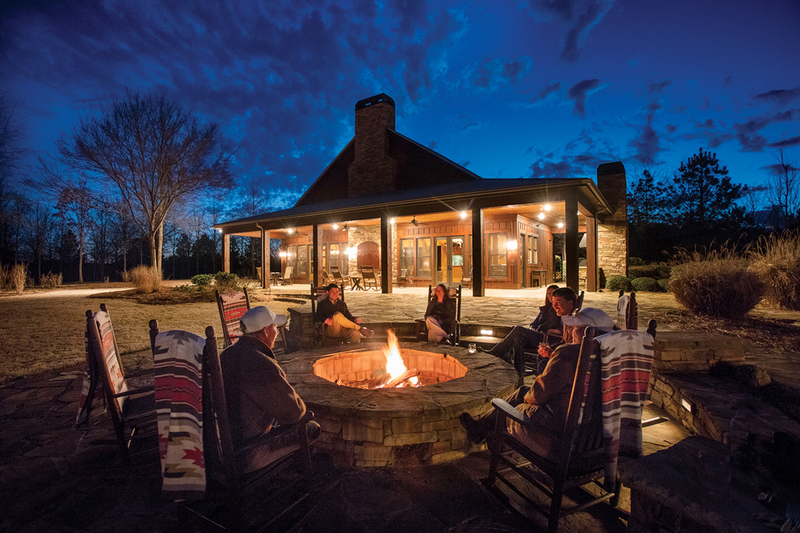 The main lodge enjoys views across the property and features a pro shop, a great room and an outdoor fire pit. Cocktails and appetizers are served at the conclusion of the day. Hunting parties split into groups of no more than three hunters per Ranger. There is also a lakeside 5 Stand setup for those wishing to hone their skills ahead of the hunt. Fishing Creek Farms is located 30 miles from Athens and less than two hours from Atlanta. Several regional airports are close by, including Greene County, in Greensboro. Airport transfers are offered, and it is possible to hunt the same day you arrive or depart, depending on your travel schedule. For more information, contact lodge manager Tyla Kuhn at Fishing Creek Farms.